The Afinia 3D printer has also been easy for Cacciatore to use, even without previous 3D printing experience. “After taking my position with the district, I took a graduate-level course, where Rodney Batschelet—who loves the Afinia brand 3D printers—became my mentor. We work in the same district, which is very convenient. Scaled model of the Medical College by CHUSD middle school students. 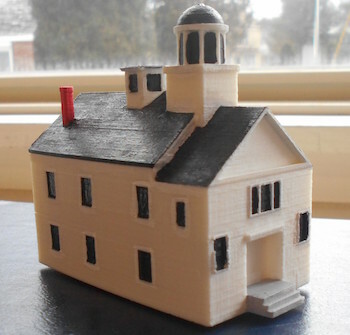 Several students from Cacciatore’s district recently participated in the 3D Vermont Architecture and History Olympiad. For the competition, the students researched two historical buildings in Castleton. Then, they used SketchUp to model and scale them to 1/200th of their actual size. After that, the models were printed on the district’s Afinia 3D printer. In Cacciatore’s school district, students in grades three through eight participate in 3D printing projects. “Each grade works on projects that are adjusted to their level of education and curriculum. 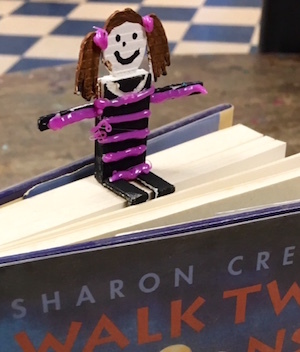 For example, some of our youngest grades have used 3D printing to make bookmarks. Others are modeling and 3D printing multi-piece catapults, which require a lot of math, or are creating scale models of the solar system for their science classes,” tells Cacciatore. 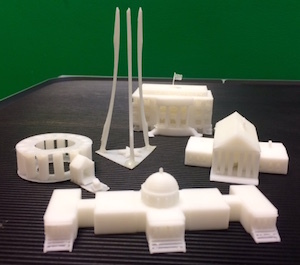 Students 3D printed Washington D.C. monuments for a social studies class. Cacciatore also explains that the social studies teacher had students use the 3D printer to recreate some of the monuments in Washington DC. “They put QR codes on the models they’ve created, and it gives the 8th grade students a chance to learn more about each place before they take their field trip to DC,” she says. Cacciatore says that she has noticed a difference with students since introducing 3D printing into the district. “For some kids who used to struggle to be attentive, they are now really able to take off on STEM projects. They are more engaged with their learning,” she explains. Sixth grader Courtney B. designed a hot chocolate with marshmallow holiday ornament. For some students, 3D printing is such a motivator that the school is debating using it as an incentive. They are considering allowing students who go “above and beyond” to be rewarded with being able to design (or find a pre-designed file) and print something for free. 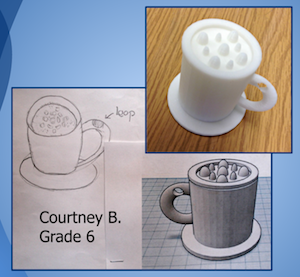 To learn more about 3D printing for schools, please see our Afinia for Educators page.